Oh how I LOVE fall! Where we live in Texas there pretty much is no real fall season. It goes from crazy hot to luke-warm and then back to crazy hot again. For a while my family lived in Tennessee and I remember how absolutely beautiful the changing of the trees was-vibrant reds, oranges and yellows. Like the trees were on fire! 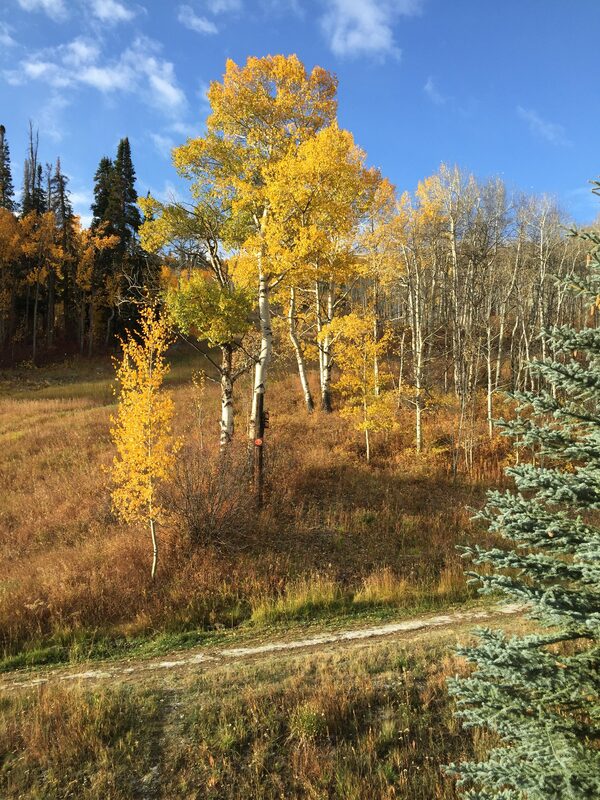 Aspen Trees: My mother sent me the two pictures below from her vacation in Colorado recently. I am SO jealous! 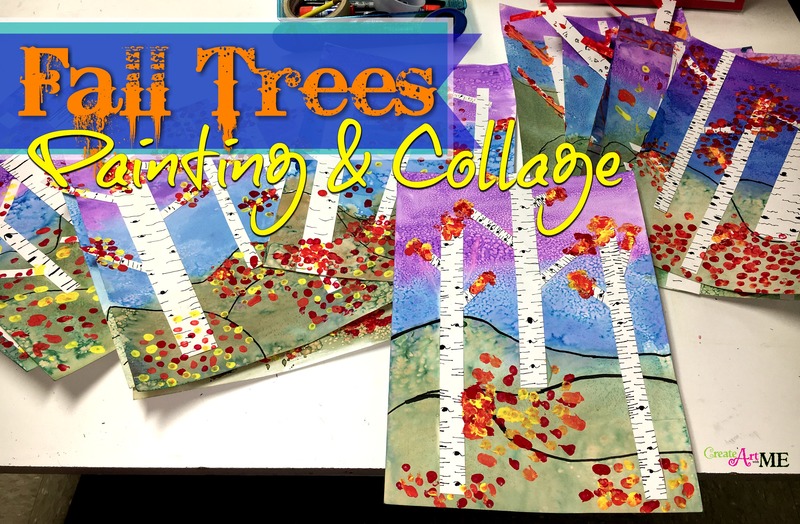 I saw these pictures and knew I wanted to create a picture with fall aspen trees. 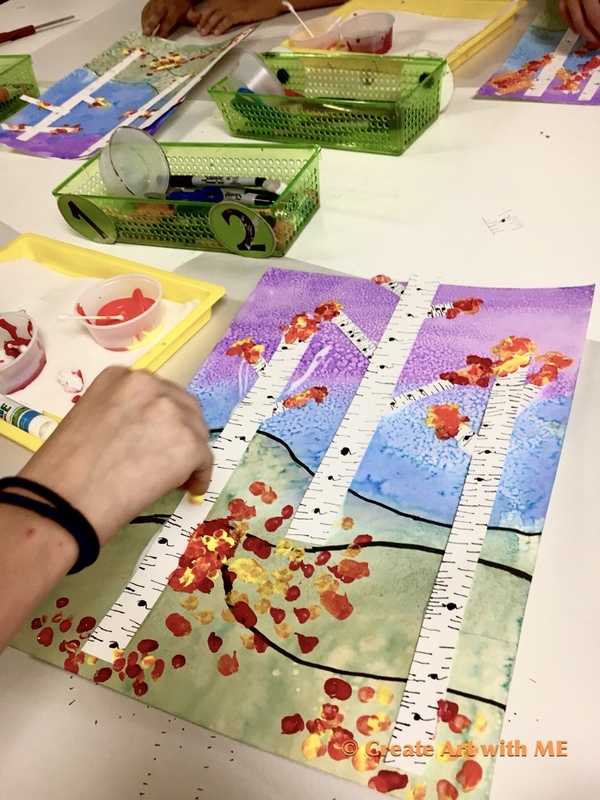 On the long & shorter strips, use a ultra fine tip sharpie to draw horizontal lines on the tree (vary the length of the lines & make sure they never go all the way across). Draw “eyes” on the strips (vary the size). Glue the branches onto the trunk of the tree. Write your name on all trunks. Paper clip together for next time. Draw 3 rolling hills on the lower half of you paper. Paint the sky with watercolors and sprinkle salt into the paint while it is still very wet. Best to let dry or they sky will bleed with the hills (as ours did-some kids really liked that though). 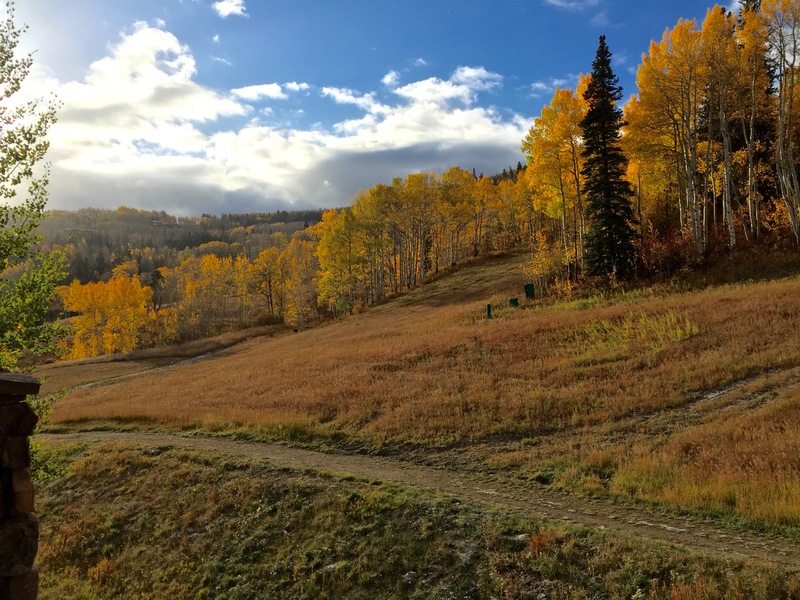 Paint the hills with green for a fall picture or light blue for a winter snow scene. 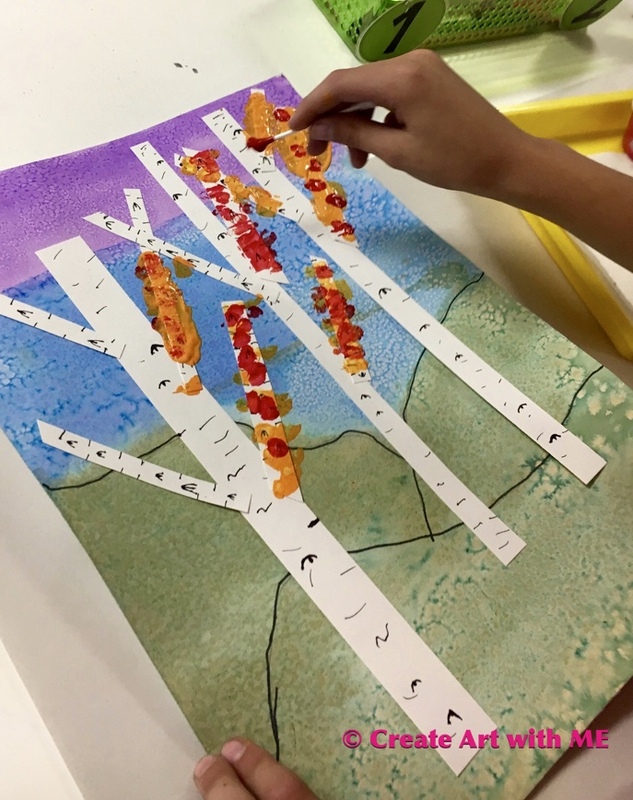 Apply with “leaves” using Q-tips and tempera paint. Try to group the leaves (like piles) instead of randomly where ever on the painting. Hi, what grade level was this? Very nice. I did this with my after school art class which currently has Kinder-4th grade students enrolled in it. 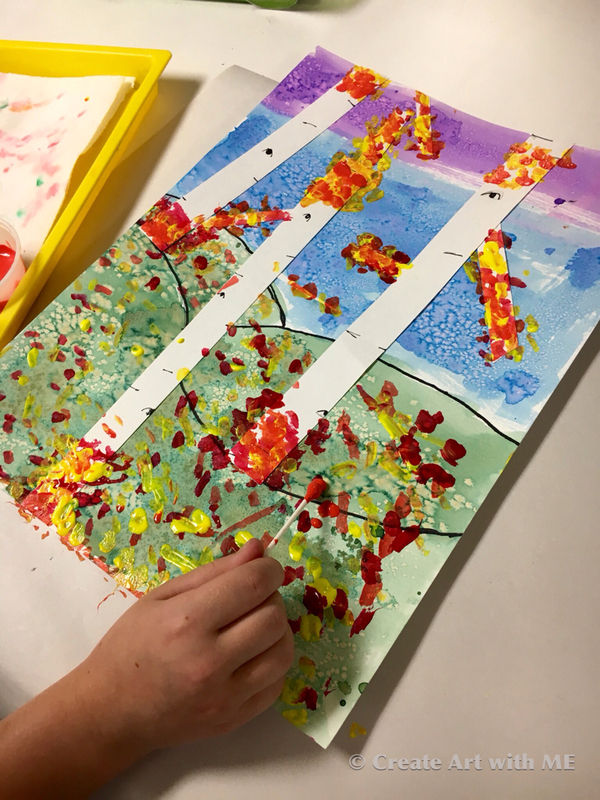 All ages very successfully completed the projects (and parents were thrilled with the art)!